José Andrés prepares this satisfying rice dish with lots of seafood, including hard-to-find cuttlefish, and a house-made fish stock. 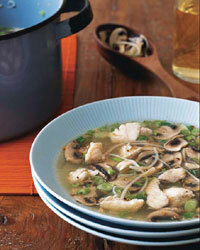 To simplify this dish at home, use squid in place of the cuttlefish, and skip the fish stock in favor of bottled clam broth from the supermarket. The first things most people think of when they hear North Carolina is college basketball, but there is also the hominy at the Magnolia Grill in Durham. The chef, Ben Barker, almost always has some sort of delectable hominy on his southern menu. 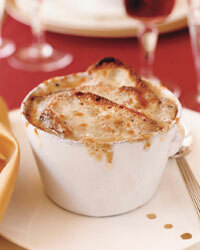 Here it's served with braised pork chops and an excellent bourbon sauce. 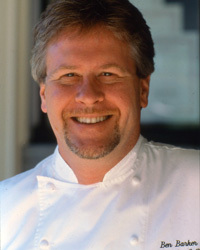 Since 1999, Gary Danko has run the quintessential San Francisco restaurant, showcasing his spectacular ingredient-driven cuisine. 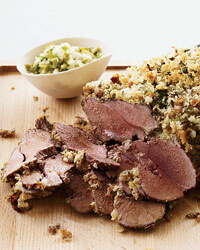 Here, Danko accompanies rich, herb-crusted lamb with a bold-flavored asparagus salad. The 1980s ushered in the era of the celebrity chef. Some big names, like John Sedlar, disappeared but are back now; others never left, like Robert del Grande, who is reinventing Houston's Cafe Annie as Bar Annie with dishes like this Southwestern pork rib stew. Jose Garces prepares this dish with hake, a relatively hard-to-find cousin of cod. He also uses fresh juice from shucked clams to make the delicious broth. 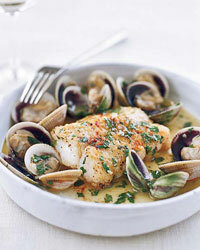 In F&W's streamlined rendition, fresh cod stands in for the hake, and bottled clam juice replaces fresh. Suzanne Goin (an F&W Best New Chef 1999) is beloved in Los Angeles for Lucques, AOC and Tavern in Brentwood, which serves breakfast, lunch and dinner and sells house-made breads and prepared foods like this leg of lamb, which she serves with a Meyer lemon salsa. When Paul Kahan develops recipes, he starts with something traditionallike leeks vinaigrette, the time-honored French dishthen adds a twist. Here he substitutes fried eggs for the standard hard-boiled-egg topping and adds crisp strips of speck, a smoked prosciutto. Traditional panelle, the popular Sicilian chickpea fritter, is deep-fried. 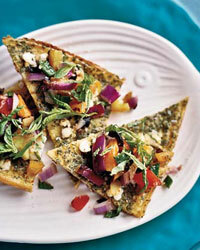 For her healthier version, Melissa Kelly forms panelle onto a sheet, lightly sprinkles it with goat cheese and bakes it. Then she cuts the panelle into pieces and sautés them until they're crisp. Chef Donald Link, the man behind Herbsaint and Cochon, has brought spirited Cajun cooking to New Orleans. 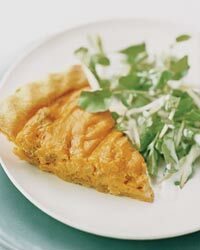 This creamy sweet potato filling is fairly simple, but Link prepares the crust by hand and tosses the salad with mustard greens, which can be tricky to find. Home cooks can instead make the crust in a food processor and substitute watercress for the mustard greens in the salad. 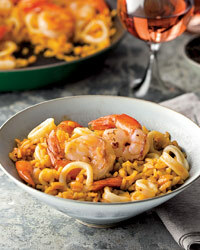 Tony Mantuano created this recipe in homage to the Calçotada in Spain. 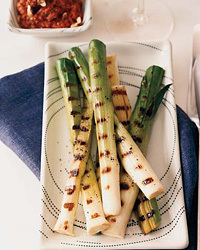 The Catalan festival celebrates the harvest of calçots, which are slender onions similar to baby leeks. After peeling the charred outer layers, festival-goers dip the softened onions in a vibrant romesco sauce, which Mantuano makes with sweet red bell peppers. "It's fantastic," Mantuano recalls. "Everyone has black fingers from the char." "I enjoy putting the Old and New Worlds on a collision course," says Stephan Pyles, one of the first Southwestern star chefs. At his eponymous restaurant, Pyles's Texas style is obvious: Nothing short of a crowbar could pry the stupendous bone-in cowboy rib eye with fried red-chile onions off his menu. At Café Juanita, chef-owner Holly Smith prepares nearly everything from scratch, from the crackers, grissini and loaves in the breadbasket to the pastas and gelati on her northern Italian-focused menu. Frank Stitt notices a marked difference between strip steaks cooked with the bone and those cooked without it: "There is this added flavor that the bone lends to the beef, and it keeps the meat around the bone especially tender," he says. 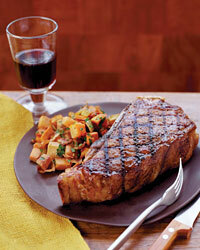 Stitt pairs these steaks with smoky sweet potato hash browns: "Sweet potatoes have so much personality for such an inexpensive, humble ingredient." Michael Symon defines himself as a "porketarian," saying he can't get enough of the meat. 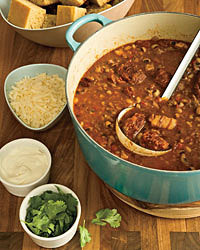 For his luscious chili, he uses incredibly flavorful and succulent pork cheeks. 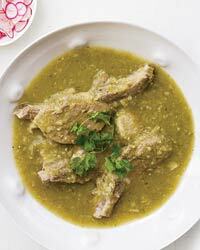 If pork cheeks aren't available, pork shoulder (cut into 2-inch pieces) can be substituted. At Poppy, Jerry Traunfeld creates amazing happy hour snacks like sweet-salty chevda, an Indian snack mix. Traunfeld tosses puffed rice cereal with coconut, raisins, nuts and a variety of spices and flavorings, including fresh curry leaves and amchoor (tart dried-mango powder), but home cooks can simplify by substituting lemon juice and bay leaves for the amchoor and curry leaves. Marc Vetri, the chef and owner of Vetri in Philadelphia, believes that many of his favorite Italian ingredientshomemade sausage, broccoli rabe and Fontina cheesego wonderfully with pasta, but make even better burgers. 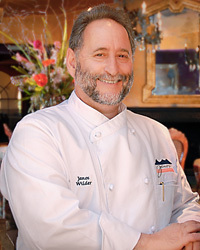 At Janos, his eponymous restaurant at the Westin La Paloma Resort and Spa, Janos Wilder creates French-inflected Southwestern dishes that have earned him numerous accolades, including the 2000 James Beard Award for Top Chef in the Southwest. In 2010, Wilder made a long-anticipated return to Tucson's city center with his latest venture, Downtown Kitchen + Cocktails, where he focuses on sensational drinks and globally-influenced farm-to-table dishes.